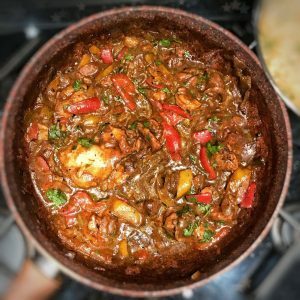 The result was delicious, my hubbie said this was his favourite new dish I’ve created in a while as not only is it lovely and filling but it has the most delicious deep and warm flavour. If you don’t like things too spicy, you can always use a normal chilli instead of a scotch bonnet in the marinade. The ingredients list might look lengthy here but most of it will be store cupboard essentials. It’s actually very quick to put together, even quicker if you marinade the chicken the night before. 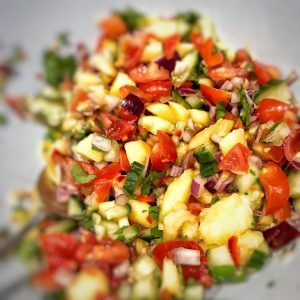 Make the salsa is optional so feel free to leave it out if you are pushed for time but it really is a delicious addition to this dish, lifting the flavour and bringing an extra freshness to a warming and filling dish. For the marinade, pop all the ingredients in a food processor and blitz until well combined. Pop the chicken breasts whole into a large bowl, pour over the marinade, coat the chicken well and then leave to marinate for at least 30 minutes (or overnight if you are prepared enough). While the chicken is marinating you can prepare the salsa – it’s as easy as popping all the ingredients in a bowl and tossing everything together. Then pop in the fridge until you need it. To make the stew, take a large frying pan, add the olive oil and bring to the pan to a high heat. Remove the chicken from the marinade bowl with some tongs (reserve the rest of the marinade in the bowl) and then add the chicken breast to the pan. Brown on one side for 5 minutes and then turn over and brown for 5 minutes on the other side. You want to let the chicken char nicely as this gives the stew the lovely brown flavour. You might need to do this in batches as all of the chicken won’t fit into the pan in one layer at once. Once the first batch is browned, remove from the pan and pop to one side on a plate and then repeat until all the chicken is sealed (it doesn’t need to be cooked through at this point). Next add the spring onion, onion, peppers and garlic to the now empty frying pan, season with salt and pepper and then fry for 6-7 minutes until the onion starts to soften. Add the tomato puree, tobasco and bay leaves, fry for another minute and then add the chicken stock and honey. Mix the cornflour with a few drops of water to make a paste, add to the sauce with the reserved marinade, stir and then add the chicken breasts back to the pan making sure the sauce covers them. Bring to the boil and then lower the heat to a simmer for 30 minutes until the sauce starts to reduce and thicken and you’ve got a nice brown sauce/gravy consistency. Pop the rice on to cook while the stew is bubbling away. Five minutes before it’s cooked add the frozen peas. After 30 minutes, once the chicken is cooked through check for seasoning and add more if required. Remove from the heat at then add the juice of half a lime. You can either serve the chicken breasts whole with the sauce or shred them into the sauce. Serve the stew onto of a bed of rice and peas and the mango salsa on the side. Would you know if I could fry of the ingredients and then pop in the slow cooker? Hoping to make this tomorrow – looks amazing! But I couldn’t see the cornflour in the ingredients list – please can you confirm how much you use? Thanks! Hi Laura me again haha! Just checking is the 10points including the rice or do we add the 6points for rice to the 10? To make it more traditional, try using red kidney beans instead of frozen green peas as, tbh frozen grewn peas aren’t used in rice and peas and it would taste much nhcer. The meal does look and sound nice though. I made this for our camping weekend. It was blimmin lovely! And really, really easy to make. So glad you liked it Angela! Lovely! Made this today and it was stunning. Used cauliflower rice to save points for gin and it was an absolute delight. Sweet, spicy and wholesome. Tomorrow I’ll use the remainder as the base to a tangle pie with shredded filo on top. It was amazing. I had some leftovers for lunch today with cauliflower rice … a very filling 2 points! Shame the BF had scoffed all the remaining Mango Salsa last night once I’d gone to bed! Thanks for another brilliant recipe.